Leo Fender had it right the first time. The circuits for the Fender Princeton, Deluxe and Twin Reverb have long been the templates on which other American amplifier manufacturers have been building on. 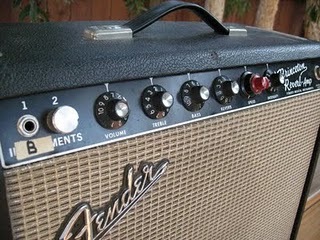 And Fender's circuitry was adaptable and relatively easy to modify. For instance, before launching his Boogie amplifiers, Randall Smith got his start by modifying Fender Princeton's in his garage, introducing cascading gain stages that enabled the little amp to scream with almost infinite sustain even at low, hotel room volumes. Across the pond, Jim Marshall was basing his earliest creations on the original tweed Fender Bassman amps, but powered with EL34 power tubes instead of the American 6L6's. And more amp hot-rodders rose to the task to meet the needs of a tone and gain hungry clientele with each building a reputation based on their work modding the amplifiers of rock’s elite -- Jose Arredondo (Eddie Van Halen, Steve Vai), Harry Kolbe (Al DiMeola, Allan Holdsworth, Yngwie Malmsteen) and Paul Rivera (Steve Lukather, Larry Carlton and many of LA’s session elite). Rivera was also a pioneer in building custom pedalboards and effects racks for studio guitarists in the late 70's. Which brings us to Mr. Lukather's Rivera-modded Princeton. As the eBay listing describes it, this Princeton was Lukather's 'go to' amp from 1976 to 1982 and has appeared on a lot of his session work. And it's not surprising. With its low wattage -- two 6V6 power tubes producing all of 12 watts -- the Fender Princeton was the secret weapon of many studio guitar players. The amp could be cranked if needed without becoming overbearing and, with a possible modification or two, could produce a gamut of tones from silky clean to high-gain. Rivera's mods to Lukather's amp in this case included a 6-position rotary switch in place of the second input jack which enabled a selection of six different mid-boost frequencies. The red knob that was installed in place of the vibrato speed knob is a control for adding gain to any one of those six mid-frequencies. As he did to most of the amps he worked on, Rivera also probably reworked the amp with his Stage 2 Plus mod where the preamp, output stage and power supply are modified to produce a smoother, more articulate distortion. Paul Rivera went on to manufacture his own line of Rivera amplifiers in the late '80s. Lukather, ever the loyal customer, started endorsing his own signature model Rivera Bonehead amps in 1999. Is there any way i can get a hold of the mods? Miguel, any luck on those mods? Hardest thing to get a hold of...I've been trying for over 20 years to get the print on what Rivera used to do to Fenders and Marshalls when he was working at valley arts. Secret is to grab one when they go up on ebay.